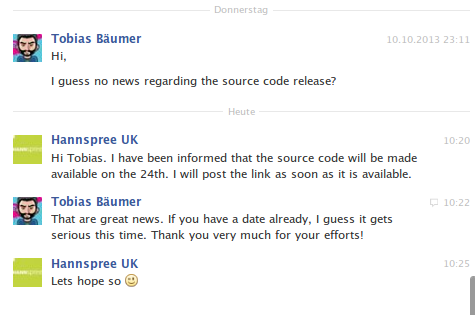 Till now I’ve got no new information from Hannspree, which is kind of frustrating. I’ve now also written directly to Infotmic but I don’t think they’ll answer. I already started own repositories, based on the source code for the i-onik TP7-1000DC – a very similar device. You can find them in my Github profile, but till now they’re not more than skeletons based on the other device. If you want to help, just fork them and make a pull request afterwards. I’ll keep you (Hi Nick, lol :D) updated.